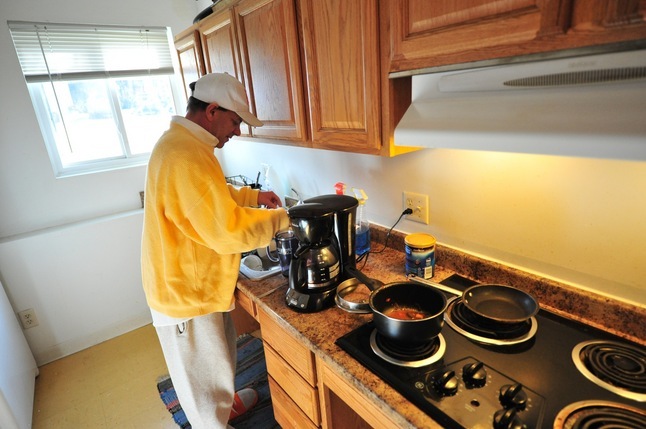 Posted on Thu, Jan 24, 2013 : 5:59 a.m.
Tommy, a resident of one of Dawn Farm's transitional houses near downtown Ann Arbor and a recovering alcoholic, does his dishes on a recent morning. For addicts and alcoholics serious about recovery, Dawn Farm's transitional housing program in Ann Arbor can be a game changer — just ask Tommy. "It's meant everything," said the 46-year-old recovering alcoholic. "I mean, I'm sober, I live here ... and it's a safe environment. 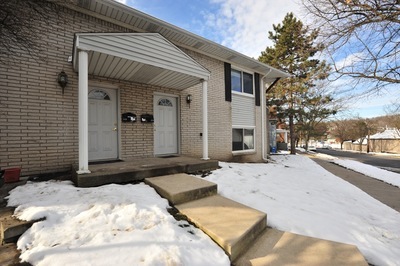 The transitional houses are great." A self-described "drunk," Tommy, who doesn't want his last name used, said he struggled to keep a job back when he was drinking, and he found himself in and out of flophouses. Simply put, life wasn't all it should be. Relationships suffered. Now sober and living in a transitional house near downtown Ann Arbor — with roommates also trying to stay clean and sober — he has the stability and accountability he needs in his life. "A lot of people's lives have been changed going through the houses," he said. "You become good friends. It's almost like a frat house without the booze. We become brothers, lifelong brothers." There's a reason why Dawn Farm's transitional housing program, which puts addicts and alcoholics on a path to recovery, is called the Chapin Street Project. The nonprofit agency opened its first transitional house at 112 Chapin St., which up until that point had been "a notorious crack house," recalls Jim Balmer, the agency's director. The tenants were evicted one day, their belongings thrown out on the front lawn, Balmer said, and Dawn Farm seized the opportunity to fill the house with people serious about getting a fresh start in life. The agency rented the house, and just like that the program was born in 1998. Fifteen years later, Dawn Farm operates 12 transitional housing sites in Ann Arbor at six houses and six apartment complexes. Added up, the agency has about 170 beds, and Balmer said there's a four- to eight-week waitlist for anyone who wants to get into the program. The agency is looking to expand the program after receiving a $150,000 grant from the Ann Arbor Downtown Development Authority this month. "The reality is there's a huge recovery community in Ann Arbor and more people getting sober all the time," Balmer said. "Before we started, if people wanted to get into transitional housing, they had to leave the county — they had to go to Pontiac or Highland Park or Taylor." Now they can get help right here in Ann Arbor — if they want it. And they have to want it, Balmer said, because it's not an easy program. "It's not for wimps," he said. "There are some transitional housing sites where you just pay your rent. Ours, not so much. You've got to do community service. The bar is set pretty high." Tommy is back in transitional housing with Dawn Farm for a second time. Things were going good before — he was even the assistant house manager — but then he relapsed. "I had two years sober, I relapsed, and I moved out," he said. "And they let me move back in. I drank for eight days, and now I'm back here just because I wanted to give myself the best chance I could. It was like, hey, something went wrong, so move back here — it's safe." He said he's been sober again since Halloween, and he's holding down a steady job at a local restaurant. In his spare time, he's looking into getting a degree in political science. "I'm trying to go back to school and work," he said. "I'd love to get into politics." But he doesn't have all that much free time. Tommy goes to nine Alcoholics Anonymous meetings every week, which is mandated as part of the transitional housing program. One of Dawn Farm's transitional housing sites on Summit Street near downtown Ann Arbor. The building is broken up into different units, each with a handful of tenants who are recovering addicts and alcoholics. "The minimum if you're working is nine a week," he said. "If you're not working, and you're looking for work, you go to 12." The meetings are held every night inside churches all around Ann Arbor and also at the Washtenaw Alano Club on Maple Road. It's where some of the biggest strides on the road to recovery happen, and where close bonds are formed. 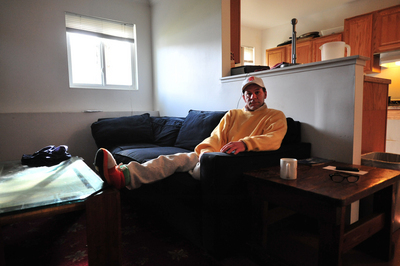 "If you go to AA and you don't make friends, you're not going to stay sober," Tommy said. Tommy said he's made many friends in the program who encourage him to stay the course. They even do community service projects together. "We go out into the community and we'll do stuff for the community," he said. "Like we'll plant flowers in May for the hospitals. Or you see flowers in the middle of the streets — we do that. "We go to the Salvation Army, we go to churches," he said. "They require us to do two to six hours of community service every week." People who live in the transitional houses also go down to Dawn Farm's detox center and cook food for the people who are detoxing off alcohol and drugs. Tommy does that twice a week. "I've been to people's weddings, their funerals, their baptisms," he added. "My old roommate and I went to Cedar Point last year, and Tigers games and stuff, so you get to know these guys and you build a life with them. It's not just about going to meetings — you build a life." Every one of Dawn Farm's transitional housing sites has a house manager who is a longtime sober person. Tenants pay about $425 a month for rent with utilities included. Tommy, proudly wearing his favorite Detroit Tigers hat inside his living room, said one of his favorite pastimes is going to Tigers games with friends he's made through the transitional housing program. They aren't expected to stay in the houses long. They can stay for up to two years. Balmer said six months to a year tends to be a typical transition time. "It really is a way to jump-start people back into independent living," he said. "Even we were surprised at how effective it has been. When we started, we really didn't know how it was going to work out." The agency doesn't mess around with people who aren't driven to succeed, and that's why it sets hard rules. Like its mandate that all tenants must get jobs right away. "One of the things that's been most controversial about this program is we say you have to get a first-shift job within two weeks," Balmer said. "People sometimes say, wow, two weeks?" But the results speak for themselves, Balmer said. Dawn Farm has admitted more than 3,000 recovering addicts and alcoholics into the houses since 1998, he said, and only about 30 have been kicked out for not getting a job — or about 1 percent. The agency doesn't keep statistics of recovery rates for the program because it doesn't look at it that way — its clients have a chronic disease that can't be cured, only treated, Balmer said, comparing it with diabetes and noting no one ever asks about the recovery rates for diabetics. "In the last couple of years, we eliminated the concept of discharge," he said. "We think in terms of engagement. This is an ongoing disease that has to be treated for a long time." The Ann Arbor DDA has recognized the value of Dawn Farm's transitional housing program throughout the years and has offered its assistance, channeling money from its housing fund. "They played a role in the very beginning of our transitional housing program," Balmer said of the DDA. "We keep expanding and there's always a wait." Balmer said the goal is to get up to 200 beds this year. The money from the DDA will help pay down the agnecy's long-term debt on transitional housing sites at 343 Beakes St. and 324 Summit St. Both properties are within a quarter-mile of the downtown district boundary, which is the rationale the DDA uses when giving out grants. DDA officials said Dawn Farm's transitional housing serves people who, in many cases, are downtown employees and users of the downtown. 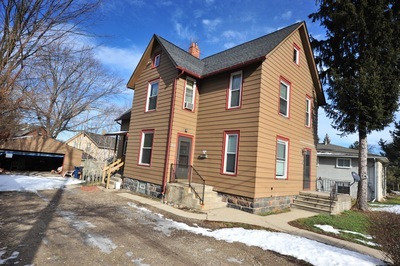 This house on Beakes Street near downtown Ann Arbor is one of two houses the Downtown Development Authority has agreed to help Dawn Farm pay for. "Dawn Farm has been an important partner in helping the downtown community deal with panhandlers and other street people, many of whom are addicts," said DDA board member Joan Lowenstein. "Addiction to drugs and alcohol is a major cause of homelessness, so when Dawn Farm helps people transition back into housing and employment, we solve a problem that affects the downtown." At the time of the request, Dawn Farm had a debt of $245,000 on the two properties. Balmer said the grant lowers the debt enough to save between $30,000 and $40,000 in interest over time. Dawn Farm's transitional housing program is part of a wide array of services offered by the agency, including residential treatment, outpatient services, detoxification, outreach, recovery support, an extensive education series and even a program for teens using drugs. 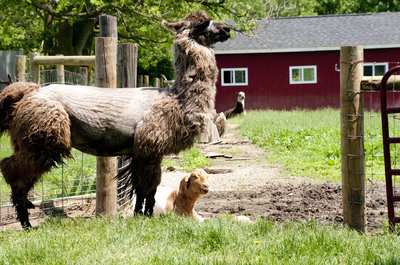 Llamas and goats enjoy themselves at the actual Dawn Farm on Stony Creek Road in Ypsilanti Township. The 64-acre farm is the site of the agency's main treatment center. Since 1973, the agency has prided itself on being a place where addicts and alcoholics could go for help, regardless of their ability to pay. It reports helping more than 2,500 people a year. On Sept 8, the agency is planning to celebrate its 40th anniversary with its annual jamboree, a festive event attended by as many as 1,500 to 2,000 people every year. Despite an economic and regulatory environment that has forced other community programs to close, Dawn Farm's leaders say the agency has continued to address the needs of homeless and disadvantaged addicts and alcoholics, but not without some budget struggles. Public funding has decreased, the agency reports, and in recent years the United Way of Washtenaw County cut funding for addiction services — a net reduction of nearly $100,000 to Dawn Farm. In 2010, the agency expanded detox services into the Spera Recovery Center at 502 West Huron, adding five beds, despite the loss of public funding for the site. Dawn Farm is registered as a nonprofit under the name Dawn Inc. According to the most recent documents on file with the IRS, the agency took in more than $4 million in revenue for the fiscal year that ended Sept. 30, 2011, up from $3.3 million the year before. Contributions and grants were up 15 percent at more than $600,000, program service revenue was up 14 percent at nearly $3.1 million, and investment income totaled $283,697. Expenses for the year were $3.7 million, including $2.2 million in salaries and benefits, leaving a nearly $325,000 surplus — after a year where it ran a $60,000 deficit, which came on top of a $155,000 deficit the year before that and a $180,000 deficit the year before that. Balmer said the transitional housing program, which brought in $590,304 in revenue in the last year reported, isn't going away anytime soon — the houses will be sustained essentially permanently, he said, and donations have helped ensure that. One of the program's longtime donors is a woman who lived next to the original Chapin Street house for years. Balmer considers that one of the best testimonials possible for the program. "Our houses are good neighbors," he said. "We just got another check from her a couple weeks ago. She's sort of one of our fiercest allies." According to the Ann Arbor Police Department, there have been 27 calls for service during the last three years at five transitional housing locations owned by Dawn Farm near downtown. Ann Arbor Police Lt. Jim Baird said few, if any, of those calls were for any type of police-related emergency and few were even crime-related at all. He noted some could have been incidents that occurred elsewhere but were reported by people at the transitional houses. Tommy said there's a sense of solidarity among those seeking treatment through Dawn Farm's programs, and they work to keep each other in check. "Do people fall? Yeah, but I mean, it's an addiction," he said. "Some people fall back off the wagon and they relapse, but a lot of people — as a matter of fact, a guy last night just got two years sober and I didn't think this guy would get 10 minutes sober. He's become a really good friend." The program is set up so that those who have been clean and sober for longer periods are there to help guide and motivate those in earlier stages of recovery. "That's what they really push here at Dawn Farm — help the next guy, help the next guy. It's like 'Pay It Forward,' the movie," Tommy said. "We pay it forward to other alcoholics and addicts, but we also pay it forward to the community. "Then you don't have a bunch of drug addicts and alcoholics running around drunk and high on crack in the community, breaking into people's houses," he continued. "You've got sober addicts and alcoholics trying to lead structured lives." Fri, Jan 25, 2013 : 11:20 p.m.
Thu, Jan 24, 2013 : 5:11 p.m.
Thu, Jan 24, 2013 : 5:04 p.m. This program changed my life. I am now about to receive my MS in cell/molecular bio, and I owe it to Dawn Farm for helping make it possible. My only critique on this piece would be to include a link for those who want to donate (if one exists). Great job, Ryan! Thu, Jan 24, 2013 : 3:43 p.m.
Thu, Jan 24, 2013 : 1 p.m.
Thu, Jan 24, 2013 : 11:56 a.m. Thanks for this in-depth article, I'd been familiar with Dawn Farms broadly but it was great to learn more about it. Terrific program really making a difference, and good to see real reporting on AnnArbor.com You're a gem, Ryan! Thu, Jan 24, 2013 : 11:27 a.m. I'm not a fan for DDA, but for their support of Dawn Farms, I will give them kudos. This program is exceptional and God Bless them and the work they do. Thank you.